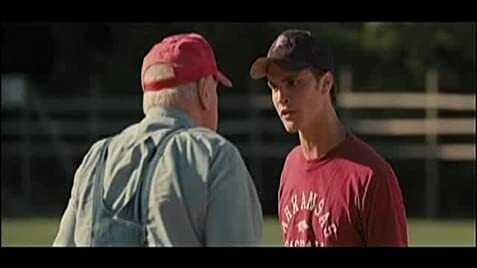 In the town of War Eagle, Arkansas, Enoch (Luke Grimes) is a shy high school pitcher with a stuttering problem. He lives with his mom (Mare Winningham) and grandfather Pop (Brian Dennehy). His only friend is smart-mouthed wheelchair-bound Wheels who suffers from Cerebral Palsy. Wheels constantly pushes Enoch to gain confidence while Enoch defends Wheels from bullies. Abby takes a liking to Enoch but he struggles to ask him out. Wheels is raised by his single mom Jessie (Mary Kay Place). I really like the friendship. The young actors are fine although I wish Luke Grimes looks better as a baseball player. They're assisted by some great veterans. The story isn't too intense. It's a sweet coming-of-age story.